It is getting real warm on the Broward. My air conditioner has been on its last legs for over a year now. I didn’t think we would make it through last summer and prayed for another year. Well my prayers were answered last year but I guess my time ran out. Thank the Lord it wasn’t any hotter than it was and we just replaced it. Seems I was not the only one on the Broward experiencing some “air conditioning” heat problems. I notice “George”, the Yellow Crowned Night Heron, spending a lot of time in the yard hunting for food this past week. George must have been getting a bit overheated because as I glance down at the dock I see him stretch out his wings towards the sun and fold them down at his side to air things out in front so to speak to cool off and dry. I have seen a similar "pose" with the Anhinga's which are swimming and diving birds, and thus have a need to dry their wings out in the sun in a similar fashion. This is the first I have observed a night Heron, which does not dive or swim, display its feathers in this manner. George is partially obscured by the Cyprus tree so I move out on the porch and push the doohickey. Caught you George! He looks like a “flasher” opening a raincoat. The camera click is audible and George turns his head to look and spies me with the camera. You would think he is embarrassed the way he quickly folds his wings up and jumps up on the dock. Then he looks straight at me as if to say “You wanna picture buddy?,,,Take this!” and he turns towards me with all his glory exposed and appears like he is “flashing” me. WHAT A SIGHT! Later I catch George sitting in the stream like a duck cooling off in the water. I sit down beside him and watch him take a complete mud bath. I know most all marsh birds bathe but this is the first I observed it this closely. George dips his head down underwater and jams his beak in the muddy bottom and gets a good mud bath and facial. He then sits up on his rump like he is in a Jacuzzi tub. Then it is shake and twist time. Hurts my neck just watching him. After this he hops over to the other side of the bank, shakes his feathers again and “airs” out his wings like he did on the dock. I notice George, the Yellow Crowned Night Heron behind the Cyprus Tree "cooling off " so to speak. George hears me click the doohickey and turns his head in my direction. George covers up and jumps up on the dock. You wanna see something? He seems to shout! Later I see George sitting like a duck in a stream cooling off. George begins to get a Broward mud bath special. Ahh, nothing like a nice mud bath on the Broward. Then you fluff and shake! Than a good wing fluff and stretch! Then get the kinks out of that neck! Then a test fly to air things out! Time to "air" it all out again..AHHH that feels great! Little does George know I have put these photos on his "Feather Book" page. It is a steamy sunny morning on the Broward. The waning moon is partially obscured by clouds for a while in the early morning light. Fortunately the slight breeze is keeping the small gnats and mosquitos at bay. As I look up I see a small heron like bird flying from the west towards the rising sun. I think I have seen this same bird a few time earlier but it was high and moving fast. Today it is lower and within camera range. I press the doohickey as I lock on to the flying fowl. I am correct in my assumption. My first confirmed Green Heron sighting on the Broward. Although only a few frames are captured in the fly by it is indeed a mature Green Heron. The tell tale dark green crown and brown stripped neck and throat feathers are clearly seen in the photo. This small stocky member of the heron family has not been seen but rarely on the Broward since I started watching but I am glad to add it to my list of confirmed bird sightings. This small heron is one of the few tool-using birds and has been filmed dropping pieces of bread into the water to attract fish and catching them. Later I spot a group of three Green Herons flying overhead so although few in numbers they are definitely in the area now. This week I also add another bird to my confirmed sighting list. A pair of black and white Swallow-tailed Kites. As I was attempting to photograph the Roseate Spoonbills I notice a pair of soaring hawk like birds circling over the trees behind me. Swallow-tailed Kites rarely flap their wings when flying, instead they use their swallow shaped tails like a rudder to maneuver in the wind. Their search pattern brings them directly overhead and indeed I now have a very recognizable photo of this South American raptor (found commonly in Brazil, Venezuela, & Argentina). The Kites migrate to Florida during the breeding season in the late spring and summer months and return to South America in huge swarms in late August. It feeds mainly on flying insects and the occasional tree lizard. The waning moon shines in the early morning sky. My first confirmed sighting of a Green Heron on the Broward. Swallow-Tailed Kite, a black and white raptor common to South America that breeds in Florida during the Apr-August timeframe. The Swallow-tailed Kite uses its forked tail like a rudder and rarely flaps its wings in flight. An Osprey soars overhead, its eye gleaming in the morning sun. 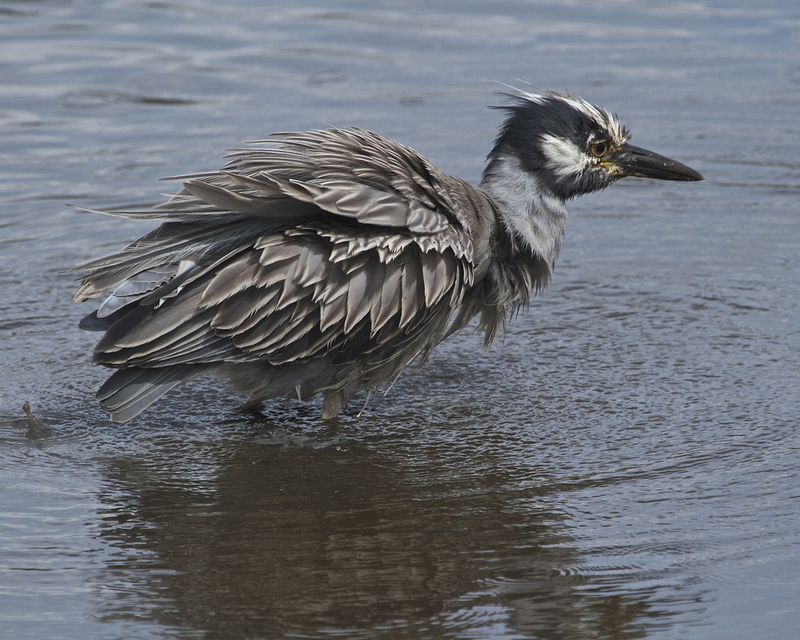 "George" the Yellow Crowned Night Heron on a fly by with muddy feet. Wood Stork on a morning flight. Female Osprey with itching claws anxious to grab a meal. The brown "necklace" feathers around the neck denote the female of the species. Males are all white under the neck. A Snowy Egret on the hunt. Black Crowned Night Heron flying by. A Great Egret, an icon on the Broward, glides by. Well Fiddle Dee Dee, time to go says the fiddler crab! One of my favorite birds on the Broward is the Roseate Spoonbill. It is also one of the most challenging birds I have tried to capture in a photograph. 98% of the time my encounter is sighting a spoonbill at low tide in the thin mud stream near the dock. I then carefully sneak down to the dock to take a photograph of this illusive pink bird only to see it quickly moving either upstream or downstream and out of camera range. When I try to anticipate and beat them prior to arrival, they are either a “no show” or show up seconds after I have given up and gone back inside. It is mid July. My first spotting of the Roseate Spoonbills was 27 April and I have been trying almost daily to get a good capture/keeper photograph. My goal is to capture one on a close fly by in optimum light and taking off or landing in close proximity. In the interim I have had several interesting interactions while observing this illusive feathered beauty. This morning there are a group of five spoonbills in the low tidal stream near the dock. My presence and slow movement do not spook them but they are careful not to come too close or feed towards my direction. That is with the exception of one bird. In some earlier encounters I have noted that the birds will allow me in close proximity but they will often turn their spoon shaped beaks and head in an upward movement and make a call that sounded sort of like a three syllable “URRH URRH URRH” which I perceived was a friendly warning. This morning as I sit close to the spoonbill I try to mimic the sound. To my surprise it turns and looks at me and repeats the movement and call. The bird then lowers its head and proceeds to walk and feed in the stream towards my direction. It then stops and does the head nod gesture which I then mimic back. It seems curious but still cautious. Finally caution wins out and it turns around and rejoins the group. But I think on some bird to human level we have communicated. Yes, I am a certified Spoonbill Whisperer now and have the Tee Shirt (well in truth my Editor has the shirt) to prove it. But I do have the photos. Later in the week I catch four spoonbills as they traverse from the stream to the dock ahead of me as I approach. They were going from one stream to another. Although not the "in flight" capture I am seeking it is as close as I have come to date. One then flies down beside a Great Egret. It lands and hops a bit further into the stream. It is deeper than anticipated and the bird quickly flies up and onto the shallow mud bank. I have never seen these birds attempt to swim. They are wading shorebirds and prefer to walk the shallow tidal stream in only a few inches of water as they sweep their spatulate bills back and forth ahead of them searching for food. Five Roseate Spoonbills feed in the shallow tidal flow on the Broward. I have dozens of photos of this bird head down, feeding and walking away as fast as possible. One Roseate pauses and looks in my direction. The Spoobill does a familiar head nod and makes a sound which I try to mimic. The bird looks at me. The Spoonbill lowers its beak and begins to feed back in my direction. I go on my belly at eye level to get this shot. Note the jumping minnow on right. I then get the head nod and call again before it turns and rejoins the group. I am a Spoonbill Whisperer now! One by one four spoonbills hop up on the dock ahead of me to cross over to the other stream to feed. The four birds pause briefly. Holy smokes, this water is too deep! Time to check out another spot! This time I will make sure the water is shallow! Yep, this is just right! My typical spoonbill shot again ! Until I can whisper them into a better photo this will have to do for now! Good morning from the sunny but muggy Broward. Hope all of you had a nice Fourth of July Weekend. I am sure plenty of grilled burgers and hotdogs were enjoyed by some of you. My feathered friends on the marsh have another favorite fare. Fresh Fish a la Broward. They fly in from every point of the compass to enjoy these delectable fish delights. Grab your coffee cup and lets enjoy some with them. The first fly-over with fresh fish is a local male Osprey. One of this raptors favorite fish is the flounder that is found in the shallow incoming tides on mud flats on the river. Finding it is one thing, catching and carrying it is another, especially when the fish is nearly as big as the bird carrying it. This Osprey is pumping feathers for all it is worth just to carry this huge flounder meal. Its unique ability to carry the fish in a fore and aft position with its claws makes it more easily flown in the airstream. Where there is a will there is a way. Hmmm, evolutionary adaptation or intelligent design....I vote for the latter. The incoming tide also brings with it some large schools of bait fish and minnows. I catch a glimpse out of the corner of my eye of a large Royal Tern swooping in low over the channel. I turn to focus and get off two quick clicks of the doohickey before it is gone with its treasure wriggling in its beak. To my right there is a veritable fish smorgasbord offering and plenty of takers. I count at least five species of marsh birds in the shallow tide. There are three Wood Storks, a Great Egret, two Snowy Egrets, a juvenile Little Blue Heron, and a Tri-colored Heron all gathered in the small channel area hunting small bait fish and minnows. No one goes hungry today. As I watch them hunt and catch I notice the Wood Storks using a particularly clever method. They raise one of the wings like a cape to see the fish better and/or spook them towards their waiting open beaks. They also use one of their feet at the same time in a sweeping motion to encourage the fish to swim towards the beaks where they are quickly snatched and devoured. One poor bird though lost a fish trying to flip it up in the air to swallow it…the fish had other plans for breakfast it seems. The Egrets seem opportunistic and closely follow the storks hoping they will scare up some fish for them or perhaps grab a snack from the stork if the chance arises. The Snowy Egret is comical as it fluffs its feathers and spots a fish and starts to chase it down. The two Heron species do their own thing and are quickly rewarded. One by the birds begin to leave, satisfied and well fed. About that time my camera also says “Memory Card Full”. Time to go. A Male Osprey with its catch of the day, a large flounder. Come on wings don't fail me now! Whew this thing is heavy! I glance up and see a Royal Tern swoop over a school of minnows. Only once chance here but which one do I choose? That one! Gotcha! Marsh birds gather for a fish smorgasbord in the incoming tide. The Wood Storks use a raised wing and sweeping foot to spook the minnows into waiting beaks. A Great Egret waits for an opportunity! Oh! Oh! I see one too shouts the Snowy Egret! I got one too! Watch this! Oh Fish feathers! It got away! A juvenile Little Blue Heron patiently waits. The Tri-Colored Heron gets one too! Red (ok Pink with red eyes) White and Blue salute to the Fourth of July! It is time to head via ferry on board the Lucy R Ferguson to Cumberland Island Georgia for a weekend getaway for the Editor in Chief. Skies are overcast with a 40% chance of rain but who cares. The history of Cumberland Island (about 17 miles long and a few miles wide at points) includes pirates, British and Spanish conquests, land speculators, naturalist, plantations, and mansions from the “Gilded Age” belonging to the Carnegie family. In 1972 it was established as the Cumberland Island National Seashore for all to enjoy and is maintained by the National Park Service. There are no paved roads or vehicles allowed. We stayed on the third floor “Porch Suite” of the only commercial establishment on the island, the historic Greyfield Inn. The only modes of transportation for visitors are; bicycle, foot, or hotel tours via pickup truck and jeep. I opted for the later for most of the weekend and had a wonderful time between the rains that occurred all weekend. It was like going back in time...way back....Let me share a little of what we saw. The Greyfield Inn is run by the Lucy Carnegie Ferguson descendants of Retta Carnegie and her husband Oliver Garrison Ricketson, Built in 1901, it is a Georgian porch style three story mansion nestled among the expansive Spanish moss covered live oaks. It is well maintained and managed and with no TV or other other modern distractions it made for a wonderful weekend getaway. Summer is not prime bird photography season on the island but I did see wild turkey, numerous deer, raccoons, gators, and the famous wild horses of the island. Our tour guide “Barbara” was especially witty and informative and a delight to be with. Barbara is a naturalist and author. I met some wonderful people at the Inn, swapped sea stories, and had some great meals and shared some photography outings with one particular couple (the Green’s) celebrating their 25th anniversary. They are also from Jacksonville and we hope to see them again. Clayton is a published and wonderful nature landscape/scenery photographer. He sent me a few photos to include also. My first tour was on the south end of the island to the ruins of the 6,720 spreading square foot Dungeness mansion, the first of several Carnegie owned mansions on the Island. Wild deer, turkey and horses are the only inhabitants of Dungeness now. Construction began in 1884, was vacated in 1924 and burned in 1959 reportedly by a vengeful poacher who had been shot on the property. The next adventure took me on the long 4 hour tour that encompassed the high points of the entire island. We visited the small north end African Baptist chapel where JFK Jr. was married in 1996. The ride was adventurous and bumpy but breathtaking. I can only liken it to the movie “Jurassic Park” and fully expected a dinosaur to emerge from the dense live oak forest. They are called "Live Oaks" because they do not shed their leaves like most other oaks. Lightning and thunderstorms cut short our tour along the beachfront but we had a wonderful time anyway. I did manage to see a few birds (Wood Storks and Roseate Spoonbills and several herons) near the mansion called Plum Orchard. Later I tried to do a six-mile bike ride back there to photograph the birds but torrential rain and lightning turned me back about five miles into the journey. Drowned rat best describes the soggy sight that used to be me when I returned to the Inn late that afternoon. On Sunday morning I did the nature tour to the south end again and got a photo of “Dirty Harry”, a piebald whitetail deer Buck. The blond (almost white) or spotted “piebald” coloring is the result of recessive genes commonly found in inbred populations. A few of the wild horse foals also had this coloration. I spent our final morning relaxing on the porch and trying to capture (vainly) a good photo of the numerous hummingbirds as they visited the bird feeder near the porch swing. Light conditions were very dark but I managed a few shots in some brief sunlight periods. The Greyfield Inn Ferry, the Lucy R Ferguson carries guests from Fernandina Beach Fl to Cumberland Island Ga.
Nestled in the Spanish Moss covered live oaks is the historic Greyfield Inn. Carnegie mansion ruins of Dungeness, construction started 1884, vacated 1924, burned 1959. Wild horses frolic on the mansion Dungeness ruins. Whitetail deer and nursing fawn on grounds of Dungeness. Am I in Jurassic Park..or a road to nowhere? Main North-South "Road" on Cumberland. Tidal Creek near Plum Orchard Mansion often full of birds (but not today) ! ! Photo by Clayton B Green with permission..he is great at nature-scapes photos! Birds (albeit not so pretty ones)! Wood Storks on a limb on Plumb Orchard. Baby Gator in the creek. "Momma" Gator in the pond at Plumb Orchard. Small Chapel at the African Baptist Church where JFK Jr got married 1996. Ghost Crab on the beach near the dunes (and turtle eggs). Can you tell which of these is not a real Turkey? "Dirty Harry" the piebald whitetail deer Buck! Ruby Throated Hummingbird male guards the feeder. Dancing on air, the hummingbird approaches the feeder. These tiny wings beat 53 times a second but are a blur with my camera shutter speed of 1/250th of a second. Sorry, gotta run and catch the last ferry! Bye, ya'all come back now. Yours Truely at Plumb Orchard Mansion. Photo by my new freind and photographer Clayton Green with permission. Super Full Moon occured 23 June, this was taken morning of 25th at 5am..